After Fallout 4 was released fans dug into the game and found countless hours of content to explore. Since then, many have completed the title and while a few pieces of DLC have been released for the game already, they have ranged from decent to mediocre. 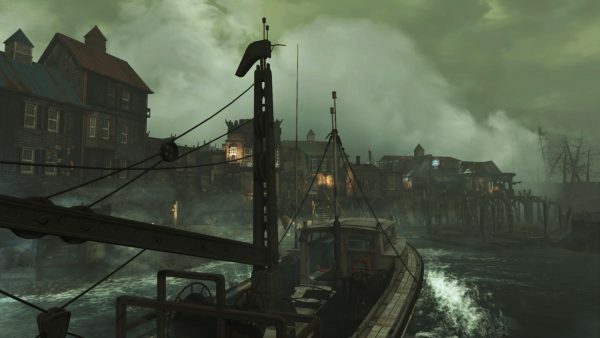 Now Bethesda has brought forth the first full expansion for Fallout 4 in the form of Far Harbor. So now that this DLC has been released, what does it have to offer? 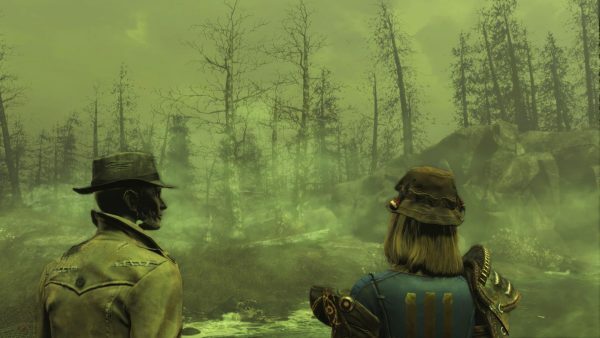 When players begin their game, assuming they have already reached the point where they meet Nick Valentine, they will be given a notice saying that they should head to the Valentine Detective Agency in Diamond City. Once you arrive Ellie informs the player that an old friend of Nick’s is asking for help in tracking down their missing daughter. After venturing to a new location in the northeast part of the map, players come across the Nakano family and are informed that their daughter, Kasumi, has taken a boat and vanished. 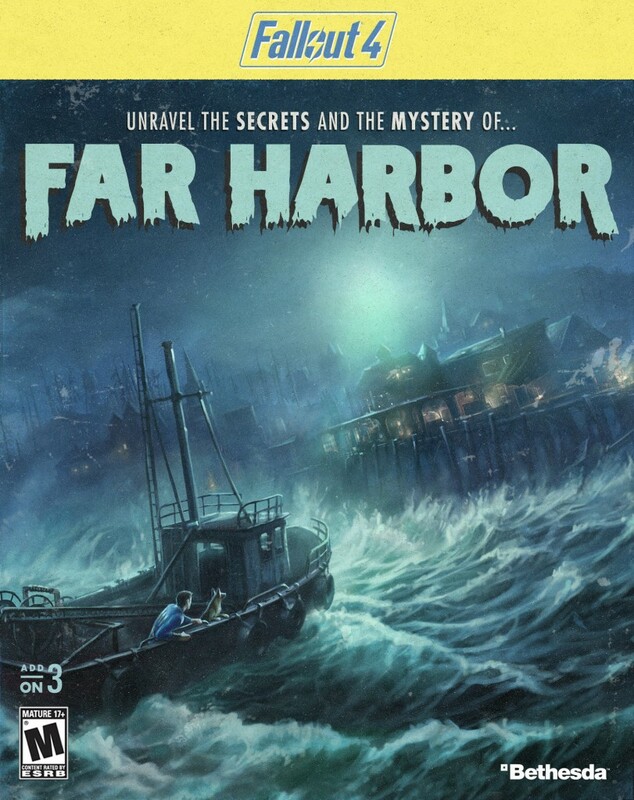 After a quick investigation using holotapes scattered throughout the house, players learn that, after talking with someone through a radio, Kasumi has traveled to the far northern island of Far Harbor in order to learn about strange dreams that she has been having. Once you arrive at Far Harbor it is clearly evident that things are strange on this island. A strange and potentially deadly fog has spread throughout the land and with it come mutated creatures of the deep that have forced nearly everyone into a small dockside settlement. After repelling an attack from these new creatures, players learn that not only are these villagers trying to eke out a living while trying to hold off the fog and the creatures inside of it, but that the Children of Atom have managed to secure themselves a solid foothold where they worship the fog and the radiation of the island. In the middle of it all is the facility of Acadia, a synth refuge and it is here that players will be spending the majority of their time as the story relies on a central character in Acadia to advance, though how you choose to do so is all up to the player. 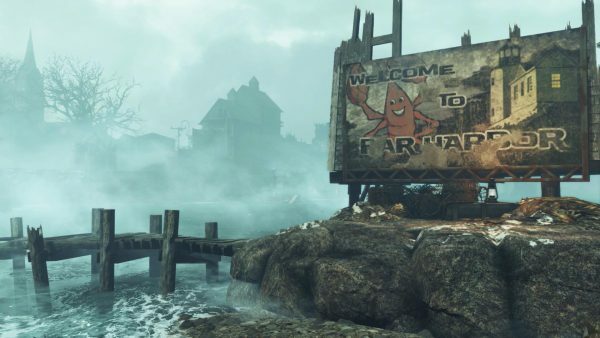 You see, while the main game featured a rather clear cut choice on what factions a player should join in order to seek out an ending, Far Harbor blurs the lines a bit by offering numerous ways for things to go down on the island. After a certain annoying quest that we will talk about in a moment, players will learn quite a bit about the history of the island and just how ridiculous the middle faction is while it is already predominantly clear what is wrong when it comes to the actions that the Children of Atom and the settlers wish to take. 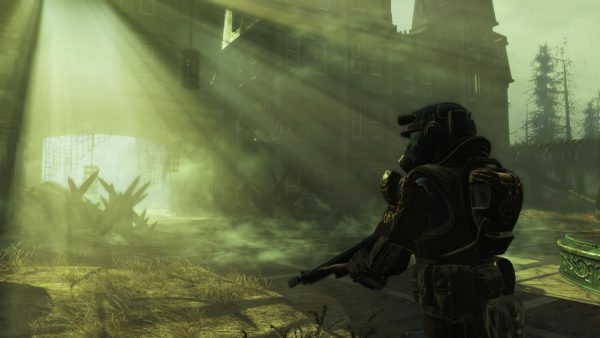 Without going too much into detail, players will have a number of options open to them in how they wish to conclude the storyline in Far Harbor and the title does not punish the player even if they decide to burn everything to the ground. In fact, even the optional side-quests that you undertake on the island can come with a few choices here and there to a lesser extent. That being said, the bulk of the details in the storyline as well as the enjoyment of it are derived from two characters. One of these is the leader of Arcadia, DiMA, and the other is one that players should realize is important to bring with them but is completely optional in the form of Nick Valentine. DiMA presents a number of interesting questions and interactions with the player and if you happen to have Nick with you he also reveals some very key details about the prototype synth’s past. The unfortunate thing is that if you happen to forgo bringing Nick, you will miss out on these extra details and the awkward interactions between the two, meaning that it is almost essential to bring Nick with to get the most out of what the story has to offer. 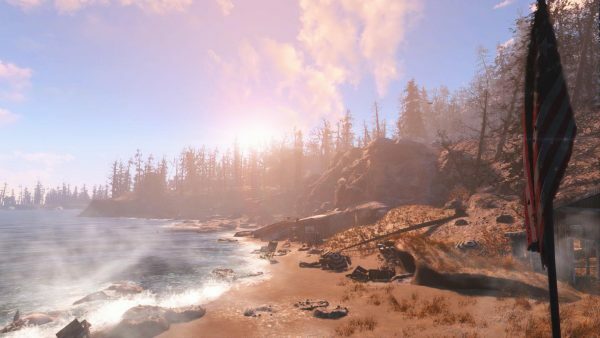 The shores of Far Harbor offer quite a bit of new content to explore. Not only is the map size of the area littered with plenty of new areas to explore, most with their own tidbits of story that can be inferred from the setup of the area but there are plenty of new enemies to take down, weapons to utilize, food to cook, a unique brand of drink, and armor to find. In fact, some of the best armor in the game so far can be found in this DLC. The core game mechanics remain the same in the island though the addition of a number of new foes in the forms of Gulpers, occasionally tricky Anglers, difficult to manage Fog Crawlers, and extremely tough Hermit Crab’s that set themselves up inside giant trucks can pose quite a challenge for those unprepared. The additions of wolves, Fog Ghouls, and Trappers also serve smaller threats, though these act the same as your standard mongrels, ghouls, and raiders so don’t expect too much new here other than some fresh equipment and item drops. These new additions help establish Far Harbor as a place that players will gladly be able to sink well over twenty hours into as they explore the brand new environment that is open to them and undertake a wide variety of new side quests ranging from simply gathering items to tackling a legendary creature known as the Red Death. That being said, there is one part that was mentioned a bit earlier where Far Harbor stumbles and that is in the form of a necessary quest that takes and puts a new twist on hacking. For circumstances that I won’t disclose, players will need to take part in a new mini-game that utilizes the game’s crafting system to take and move various blocks around to create bridges and steps, lay down turrets to protect small pieces of code, and even aim laser beams using beam direction blocks to unlock paths. This is a five puzzle sequence that starts out interesting but quickly grows extremely tedious thanks to the fact that not only does it overstay its welcome, but that the mechanics simply aren’t well-tuned enough for this type of system to work well, resulting in more frustration than anything else. One of the key aspects of Far Harbor is the fact that the land is covered in a thick layer of irradiated fog and Bethesda has managed to portray this incredibly well here. This damp and dark themed island feels incredibly eerie at the best of times and this helps provide a unique feeling to the areas that players will be exploring, a feeling that was only partially conveyed during the core game. 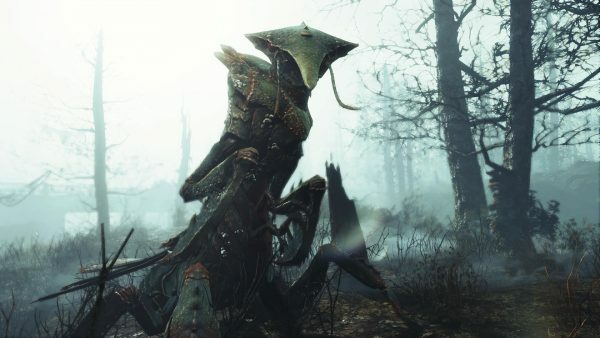 Thanks to this type of level design and the unique appearances of most creatures that players will be facing off against, Far Harbor feels set apart from the Commonwealth in many ways. The new characters that appear in this DLC are voiced quite well with DiMA and his lines of questioning coming off incredibly strong. The interactions between him and Nick also are portrayed in a fitting manner. It is easy to say that those who enjoyed what Fallout 4 had to offer at its core will be delighted when it comes to Far Harbor. By providing a sprawling new area to explore filled with new areas to explore, beasts to slay, and new armor and weaponry to bring to such fights as well as brand new quests to keep things fun, Far Harbor is a fitting expansion to the core game. It might suffer from a completely mishandled mid-story quest that ruins the flow of the game for a bit, but even the storyline and its ambiguous nature leaves things up to the player while also filling in a few blanks for Nick along the way.